Italy’s fresh produce exporters are preparing to step up the pressure on their government as they look to secure access to new, emerging markets. Only with political support, they say, will new commercial opportunities be secured for an industry that stands alongside wine as one of the country’s most important agricultural export earners. At a meeting of the action group Tavolo Ortofrutticolo Nazionale (National Fresh Produce Committee) at the Ministry of Agriculture in Rome planned for Thursday 27 September, several of the industry’s leading representatives will underline the importance of government backing in their quest to secure new trade protocols, for example with Asian countries such as China, Thailand, Vietnam and Taiwan. Marco Salvi, president of national trade association Fruitimprese and a key member of the committee, will suggest that a failure to act will place Italy’s fresh produce export business in danger of slipping even further behind its rivals, losing crucial ground as trade connections in emerging markets become more established. Salvi, who was flying the flag for Italian produce at Asia Fruit Logistica in Hong Kong earlier this month, says Italy must find new markets for its products because consumption levels in Europe are stagnant and the industry’s cost structure means that, beyond its own borders, it can only really compete “at the upper end of the market”. 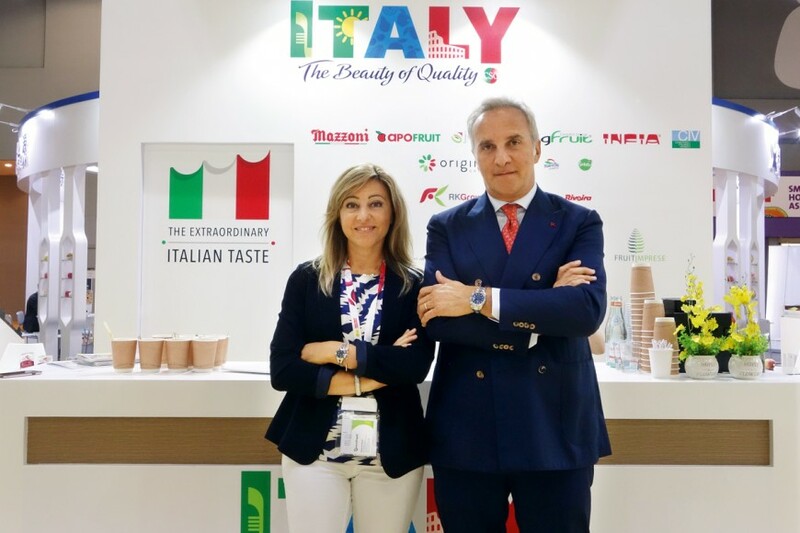 As Fruitbook Magazine notes, there has always been a notable number of Italian exhibitors at Asia Fruit Logistica, even though in reality not a great volume of Italian fruit is sold in that part of the world. The reason for that discrepancy appears clear. Italy cannot access the majority of those Asian markets because of phytosanitary barriers, but even when those barriers are lifted Italy apparently often fails to compete effectively against other sources due to a lack of organisation – supply is fragmented and poorly adapted to these markets, prices are not aligned, etc. The example of citrus in China illustrates this well: last season, Spain sent thousands of containers to Chinese ports while Italy, fresh from signing its own bilateral deal, did not send a single one. That concerted message was also conveyed to Clemente Contestabile, Italy’s Consul General in Hong Kong, during consultations at Asia Fruit Logistica, where Italian exporters emphasised the fact that their products are not only appreciated but also very much in demand among Asian importers. There are of course a number of protocol files already on the negotiating table. Simona Rubbi is international relations and new market development manager at CSO, which today acts as a common technical committee for Italy’s various fruit and vegetable organisations and also organises collective stands at international trade events for Italian companies. “For apples, we are defining protocols for Vietnam and Taiwan, and we have just started to do so with Thailand,” Rubbi explains. “As for China, where we can already export kiwifruit and oranges, we are at a good point with pears and working on apples. Whether or not that commitment will be forthcoming and indeed adequate over the coming months remains decidedly unclear.